At St. Norbert’s we believe that the teaching of mathematics should equip children with unique, powerful tools to help them understand and make sense of the world around them. These tools include logical reasoning, problem solving skills and the ability to think in abstract ways. Mathematics is a whole network of concepts and relationships which children can use to analyze and communicate information and ideas and to tackle a range of practical tasks and real life problems. Mathematics is important in everyday life. It is integral to all aspects of life and with this in mind we endeavor to ensure that children develop a healthy and enthusiastic attitude towards mathematics that will stay with them and make them happy, confident lifelong learners. 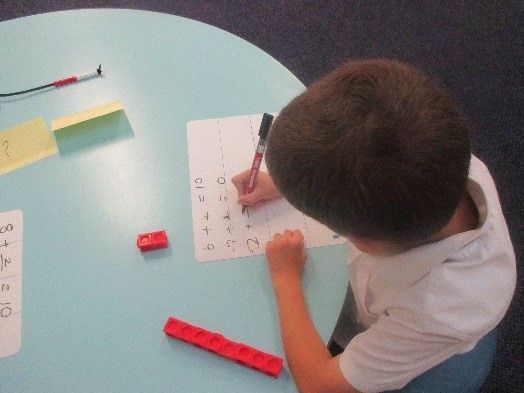 Our approach to the curriculum for Mathematics is based around a three stage approach which enables the children to practically investigate, pictorially record before moving into more formal written methods. Our Math’s is supported and underpinned through the development of: concrete, pictorial and abstract approaches. At this stage, the children use practical equipment to gain a solid understanding of mathematical concepts, making links with new learning and developing analytical thinking for problem solving. Every new area of Math’s is taught practically and in real contexts first regardless of age or ability to support understanding and deeper learning, unlocking the potential for Mastery. When children are ready, they replace the concrete apparatus with a pictorial representation - essentially a drawing which still provides them with a support to access their learning. Once children really understand the concept, they can then move into the abstract – representing with numbers and symbols and formal written methods. At the point in which children have secured their expectations in certain areas of the curriculum -their thinking is challenged and extended through open ended, higher order questioning and problem solving activities. Here children experience elements of failure and frustrations, developing the resilience to find new ways and experience joy and success – an essential life skill which we value and encourage here at St. Norbert’s.